Thanks for all the well wishes for my broken fridge last week - they worked! The fridge is now back up and running, which is a wonderful thing. And the other big news from the last week is that my munchkin is now a preschool graduate, ready to start kindergarten in the fall. Oh my goodness. Today is the first official day of summer for us, and one of my big goals this summer, other than big family fun, is to work through my Pay-It-Forward list, slowly but surely. Back in January, there was a little meme floating around on Instagram and Facebook, where people asked for 5 volunteers to sign up and agree to receive a small gift sometime during the year, in exchange for offering the same opportunity to 5 people of their own. I've got five great people to craft for, and so far, I've made some pouches and some divided baskets, and today I'm wrapping up another gift, a pouch with some EPP applique. I really enjoy doing English Paper Piecing these days, and this pouch is actually an EPP starter kit for one of my pay-it-forward peeps. I made a simple pouch, using some black yarn dyed Essex and some beautiful charms of Laura Gunn's newest collection, Edges, for Michael Miller. I used an EPP block pattern I picked up a while back, Octagon Variation #2, and appliqued it using clear thread to the front of the pouch. 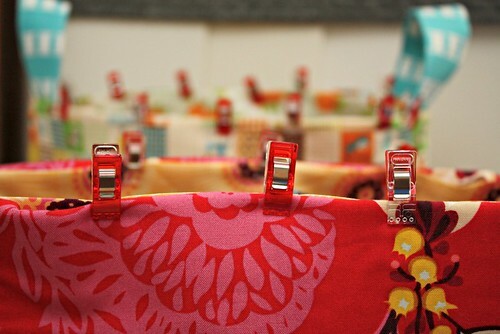 Inside the pouch, there's some needles, thread, Wonder Clips , and of course some EPP paper pieces to get started with. I sure hope that the recipient will enjoy some EPP thanks to these goodies! It's starting to feel a little bit like a sweatshop in my sewing room - I've been working on a lot of the same thing the last week, which is a bit unlike me. I'm trying to plow through my end-of-the-year preschool teacher gifts as well as some of the recipients on my Pay It Forward list. The first one I made was for Marla, as a part of a post Stash Bash swap, using some of Ellen Luckett Baker's first line for Kokka, Stamped. I really love the colors in this one, and I was so pleased with how easily the whole thing came together. Seriously, I think the fabric and interfacing cutting took more longer than the actual sewing! Then I decided to cut into some of my favorite Ruby Star Sparkle by Melody Miller for a PIF (pay-it-forward) gift. 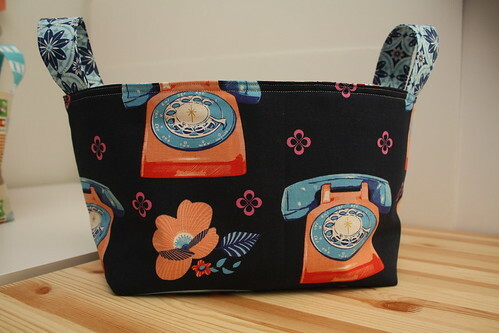 I only had a half-yard, so on the back side of the basket, the phones are upside down, but I think it's kind of endearing that way. 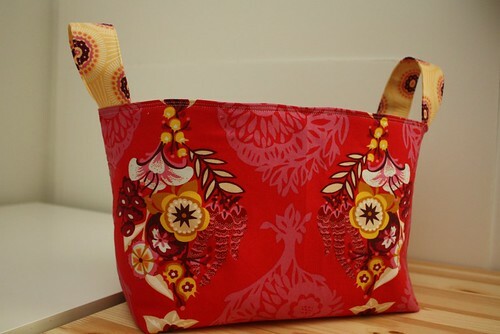 I wanted to do one more PIF (pay-it-forward) gift basket, so I pulled out a stack of Anna Maria Horner fabrics, and grabbed the one on top, a cut from Innocent Crush. As soon as I picked up the stack, I knew who this basket would be for (but I'm not telling yet!!). Because Innocent Crush is a quilting weight fabric instead of a canvas or home dec fabric, like the pattern suggests, I used two layers of interfacing for extra stability - Pellon Fusible Fleece, as the pattern calls for, and a layer of Pellon Craft Fuse, another fusible that I tend to use a lot of. It worked out quite well, so I will definitely do that again if I use a quilting cotton for this pattern. 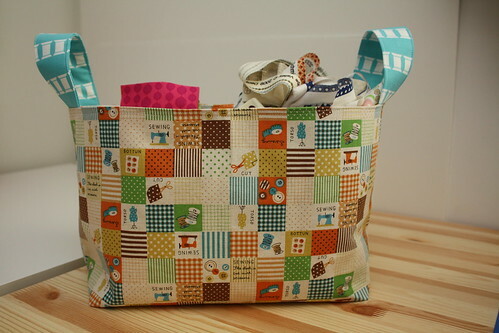 The last basket I worked on put some new fabric to use - a cheater Kokka patchwork fabric I got in Portland at Bolt. I saw Susan, the owner of The Quilt Asylum, walking around with this bolt, and she was generous enough to let me have a half-yard off of it. 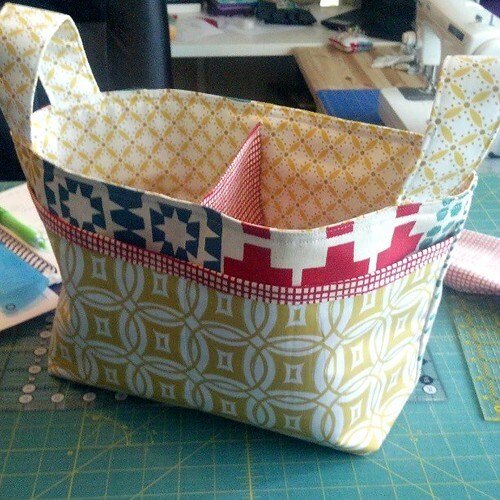 The lining is an Aneela Hoey print from Sew Stitchy, which I thought would make a cute lining for this divided basket. It would make a great scrap basket, don't you think? I've decided now I definitely need to make one for me if I wind up giving this adorable one away. What about you? 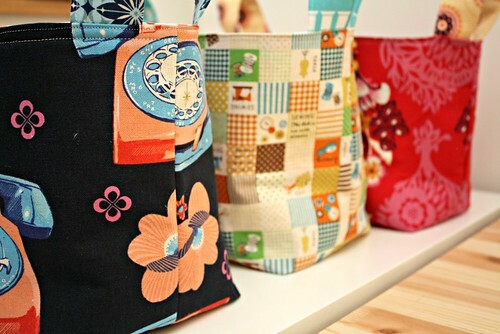 Do you like to sew the same project again and again? Have a great Wednesday!